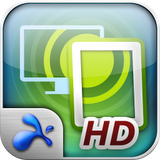 To celebrate a successful launch on the Blackberry Playbook, the makers of Splashtop Remote Desktop HD have trimmed its price to $6.99 in the Android Market, down from its previous $9.99 price tag. Splashtop's remote desktop client is one of the most popular apps of its kind, boasting over 5 million mobile users, and optimization for Tegra 2 tablets. The app allows users surprisingly sophisticated control of their desktop computer from anywhere with an internet (or 3G/4G) connection, providing access to PowerPoint and Keynote presentations, Microsoft Outlook, 3D games, full computer browsing, and various other software not available for Android. If you've been looking for a great remote access client at a reasonable price, or have been waiting for a good bargain on Splashtop, now's your chance. Just hit the Market link below and grab your copy!